In Part I of this series, I discussed one of the logistical challenges to broadening the adoption of shared use autonomous vehicles. Specifically, many trips involve multiple, intermediate stops that make it less convenient for people to utilize ride hailing services like Uber and Lyft. This state of affairs won’t change simply because vehicles become automated. Another key element of this challenge is how to accommodate travelers with non-routine or specialized needs. The ridesharing market currently focuses mostly on professional, often single and young urban travelers. However, there are many other travelers whose needs have been left essentially unmet by the ride sharing market. That is perhaps why ridesharing has only penetrated 1 percent of the US market. Some claim that autonomous vehicles that are extremely cheap and plentiful will drive people to abandon car ownership and instead buy rides on demand, otherwise known as mobility as a service (MaaS). However, such thinking has not addressed the challenges of passengers with non-routine needs. These needs are based as much on convenience, safety and reliability as on cost. The following are some examples of a few such classes of passengers. One potential obstacle to widespread use of shared autonomous vehicles is the need for young children to be strapped into car seats, some of which are customized based on age and weight. For example, in California, children under the age of 8 must be secured in a car seat or booster seat in the back seat. Child safety laws across the United States vary but in general require car seats for children until they are least 5 years old (or a certain weight) and in many cases older than that. Canada has similarly strict laws that vary by province. In the United Kingdom, children must normally use a child car seat until they are 12 years old or 135 centimeters (about 4.5 feet) tall, whichever comes first. Many parents continue to deploy car seats beyond the required age. In short, a substantial portion of vehicle passengers need to be in customized car seats. For a family of 4 with 2 adults and 2 children, one who is 3 years and the other 2 year old, the vehicle will have to provide two “regular” seats for the adults, one car seat appropriate for the 3 year old and 1 car seat appropriate for a 2 year old. For a family of 5 with 3 children of ages 1, 3, and 6, a larger vehicle will be needed with a different car seat configuration. And so on. This requirement presents several logistical challenges to shared use fleets, including the need to customize vehicles to meet the demands of all passengers. In the United States, personal motor vehicles taking kindergarten through 12th grade students to school accounted for five to seven percent of vehicle miles traveled during the morning peak period (7:00 a.m. to 9:00 a.m.) in 2009. Additional miles are traveled by families to soccer games, gym classes, and play dates or in their vehicles to work and other destinations after dropping off their children. Will shared autonomous vehicles be customized in sufficient numbers to carry families with young children reliably and swiftly? Will it be profitable to do so? Current ride hailing services do not generally focus on young families which perhaps reflects these logistical and cost challenges. Automation alone will not solve these challenges. The disabled represent a significant and often overlooked segment of the population from a transportation standpoint. Some disabled individuals are able to function independently on their own. Others utilize shared vanpools or private assistance to get around or use public transit. The disabled can also include the elderly who have trouble getting around. The United States Census reported that nearly 20 percent of Americans --- more than 55 million people in the United States --- have a disability. According to older data from the United States Department of Transportation, about 23 percent of individuals with disabilities need some sort of specialized assistance or equipment to travel outside the home. And 65 percent of individuals with disabilities drive a car or other motor vehicle. There has been a lot of discussion about the fact that autonomous vehicles could open up a whole new world to the disabled, permitting those who are blind or have some other disability to travel more easily and frequently. The percent of vehicle miles traveled by those with disabilities may therefore increase. At the same time, the needs of the disabled present several challenges to autonomous shared use vehicles, including the need to customize vehicles, have an attendant available for some passengers, and re-configure cars in special cases. Many individuals travel in their cars with pets, particularly cats and dogs. They travel to the park, the veterinarian, work, school and on vacations with them. These pets typically do not have any specialized seating: they often sit in the back seat of a car. It is likely that many pet owners will want to continue to own a vehicle for convenience and peace of mind when traveling. From the passenger perspective, there are serious questions about whether other travelers will utilize a vehicle that has the smell, mess or hair left by a pet. One can easily imagine a situation in which all or a certain percentage of shared use vehicles are pet free. The question then becomes whether enough other shared vehicles will allow pets to make it economical and convenient to utilize. Some individuals require a considerable amount of accessible, mobile storage space throughout the day. For example, gardeners need watering and plant care equipment that they must carry around from place to place in a truck from place to place. Construction workers need their tools. Medical sales representatives often carry sizable equipment from medical office to medical office, equipment that cannot be carried on public transit or in shared cars. And those running multiple errands and picking up multiple items, such as groceries and dry cleaning, store goods from the first stop in their vehicle before continuing on to the next stop. Because of their need to make multiple stops per day and carry significant equipment, such individuals typically own a car which has mobile storage capacity in the form of a trunk, back seat, etc. This state of affairs will not change simply because vehicles become automated. The categories above are not all encompassing. The key point is that the cumulative number of travelers with non-routine needs is large. Therefore, failing to address these needs could present a serious threat to the concept of a shared use future - and the potential benefits that flow from that world – less congestion, less parking demands and the ability to repurpose land. At the same time, passengers with non-routine needs present a unique challenge to future managers of shared use fleets. To expand ride-sharing or at least the use of MaaS, shared use vehicles will need to be customized, available in sufficient quantities and in close enough proximity to service all passengers in a timely manner. However, the more these specialized needs are met, the greater the cost and the more difficult it is to successfully deploy a shared use fleet. This quandary will present unique logistical and profitability challenges for managers of autonomous fleets. Further study is needed on how best to accommodate passengers with non-routine needs into an autonomous future. However, several initial steps might be taken. First, all stakeholders, including Original Equipment Manufacturers (OEMs), other fleet owners and government agencies, should evaluate how to accommodate passengers with non-routine needs in autonomous vehicles. OEMs and fleet managers should consider what types of vehicle configurations will be necessary for children, the disabled and those with pets and how they will be serviced to make them attractive to customers. For example, will a specialized fleet be necessary for “child class” vehicles that are larger than standard and accompanied by a human attendant? And what amenities (including cleanliness) will be provided to make shared use of autonomous vehicles compelling? Government agencies and OEMs should work together to craft autonomous vehicle laws that promote safety while also encouraging vehicle fleets that serve all individuals. One way would be to implement autonomous vehicle certification standards for carrying specialized passengers, such as children in car seats. In the built environment, cities should look at facilities to help travelers store goods in between stops and make it easier to utilize transit. Some individuals will continue to own simply because it more sense from a convenience or cost perspective. However, planners should consider how to engineer vehicle trips to appeal to the maximum number of consumers. Finally, once appropriate procedures are in place, education and outreach will be needed so that passengers understand the safety and availability features of autonomous vehicles. The need to accommodate passengers with non-routine needs has been overlooked. The amount of miles traveled by families and others with non-routine needs represents a significant percentage of vehicle miles traveled each year. It is useful to consider the conclusions of McKinsey and Company: “Our research reveals that 83 percent of US rideshare consumers report convenience, not price, to be the primary reason for choosing a provider such as Lyft or Uber over traditional taxi options.” By the same token, convenience may lead passengers with non-routine needs to continue owning a vehicle – unless they are given a compelling reason to choose otherwise. The needs of such travelers will not be met simply by deploying autonomous vehicles en masse and making them cheap. In short, automation alone will not be enough. Rather, we need to evaluate, from the perspective of the traveling passenger, how to make shared vehicles or rides as convenient as owning a vehicle. Only then will we be in a better position to achieve some of the hoped for goals as a result of this emerging technology. Note: Some of the content in this article was contributed by this author and appeared first in a report of the Residential and Civil Construction Alliance of Ontario, based in Toronto, "Ontario Must Prepare for Vehicle Automation, Part 2" (B. Grush, J. Niles, B. Schlecter) in which this author was a named contributor. Photo: Gust, via Flickr, using CC License. Why tie AV with shared? Submitted by CapitalistRoader on Sat, 11/25/2017 - 19:41. ...failing to address these needs could present a serious threat to the concept of a shared use future - and the potential benefits that flow from that world – less congestion, less parking demands and the ability to repurpose land. AVs don't have to be shared to realize the benefits of the latter two, fewer parking demands and corresponding repurposing of land, at least when it comes to parking. In fact, not stressing sharing will probably get people used to AVs. Why not? 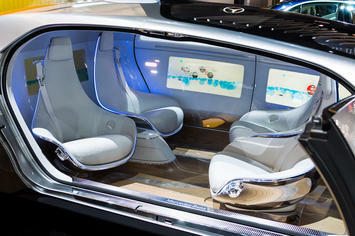 AVs will hardly be much more expensive than a car that requires a driver so the transition will be gradual. Dull, repetitive trips like the daily commute will be an attractive ride to automate. People will get used to the car driving itself. Why not invite a coworker who lives in your neighborhood to share the ride and kick in some cash? After all, in all likelihood you'll both be working on your laptops or whatever. In any case, when you get to work your car will find a free, outlying spot to park itself until you summon it. No need to park in an expensive downtown space if that's where you work. In time people will disassociate themselves from the car. It will become just another service. And then I expect car sharing will become ubiquitous but only if the shared cars offer a high degree of privacy: sealed compartments with individually controlled HVAC and adjustable privacy glass between all passengers and the outside world. Really, it won't be that expensive compared to owning an entire automobile.